When I first got these tops I didn’t think I’d wear them nearly as much as I have been, but I soon realized how great they are. Like I said, they’re baggy and relaxed, yet they work in business casual settings, casual settings, or can be dressy casual for dinner or lunch out with friends. 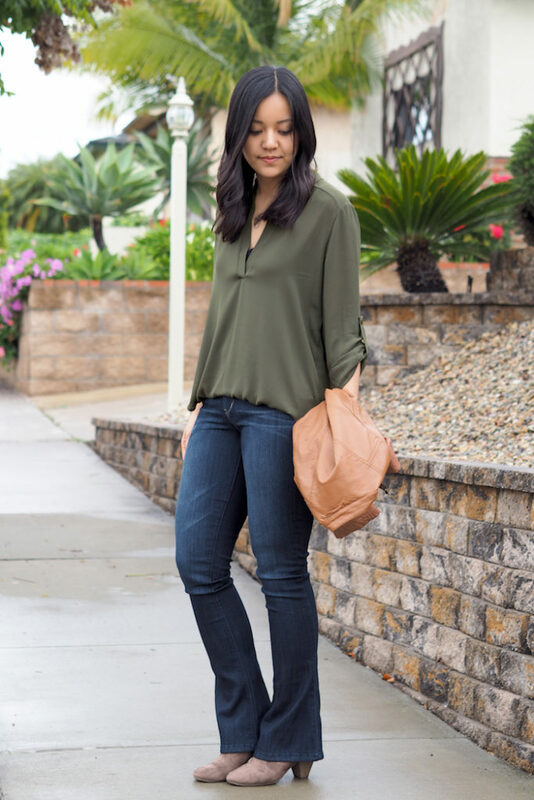 When Nordstrom recently asked me to talk about pieces from their spring essentials list, and I saw this olive tunic on the list, I was of course was like YES because I would have talked about this top anyway! 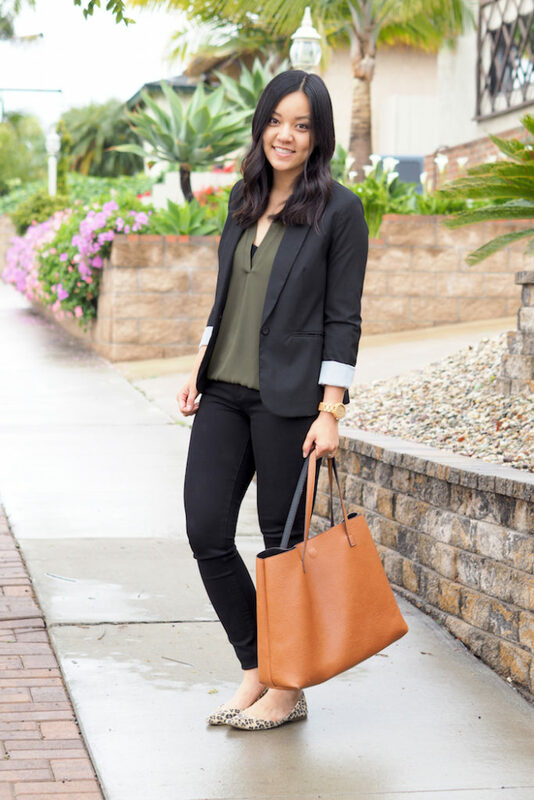 Nordstrom curated a collection of essentials for this season that are meant to stand as classics in your closet and work in a lot of different scenarios. Today is the first of two posts I’ll be doing talking about items from Nordstrom’s list of essentials, which you can find HERE if you’re interested. This blouse was on the list, and I can definitely see how it would stand as a closet classic. And it’s totally versatile! As I mentioned, this top is shorter than the ones I picked up last year, but I like that better. The old version is very long, hitting me mid-thigh, and I have to tuck it in or else it looks weird on me. This one still covers my rear, but I can wear it completely untucked if I want a more laid back feel. It’s available in olive, black, lilac, rose, and ivory (HERE). I’m normally S/M or size 6 on top and wearing this in M.
The first look is casual business casual with black jeans and a blazer. I really, really cannot help but pair this top with leopard shoes. I don’t know what it is, but I guess I just need some pattern somewhere! 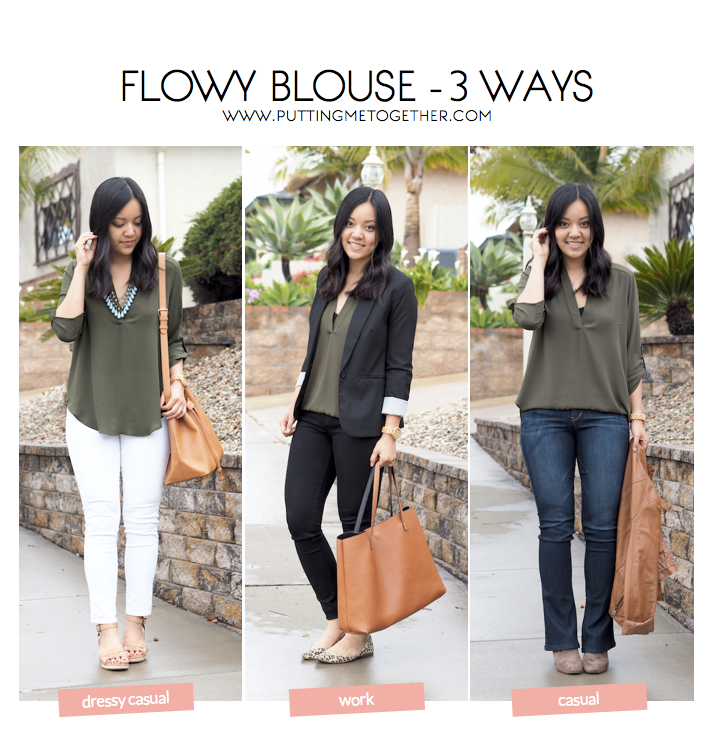 For a dressy casual look, I started with white jeans to brighten up the olive for spring. I added a turquoise statement necklace to dress it up a bit and finished it off with my new super duper comfortable wedges. I’d either wear this on a casual day when I want to look a little nicer, or I’d wear it for a date or lunch/dinner out with friends. I haven’t actually worn this outfit yet, but I’m so ready to cuz I think it’s my favorite of the three! Turquoise and olive is so fun! This last one isn’t that distinct, but I just wanted to show the top with regular blue jeans. It’s an easy pairing, and I’ve worn this top with regular blue jeans and striped flats, tan flats, or ankle boots as shown here. You can also wear a cargo jacket over this top, though I didn’t do it with this olive one because it would probably look better if the top and jacket are different colors. 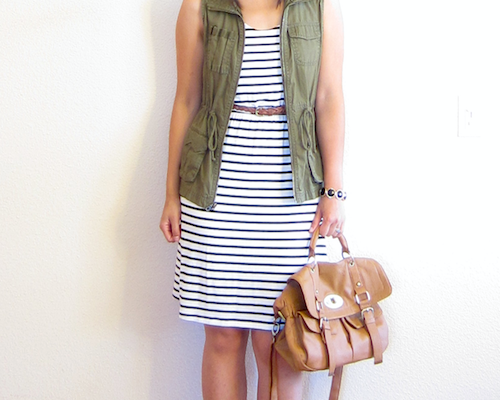 An example of this top in white with a cargo jacket is HERE. See why I love it? 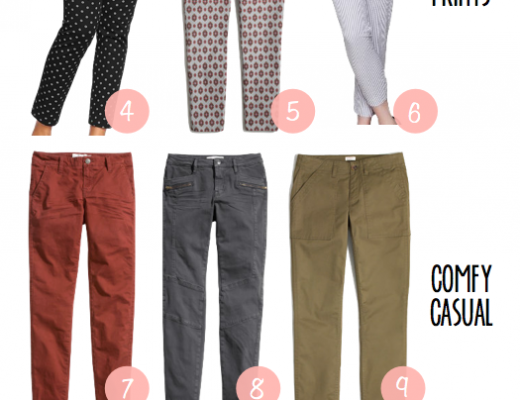 Stay tuned for my second post later this week on trousers. 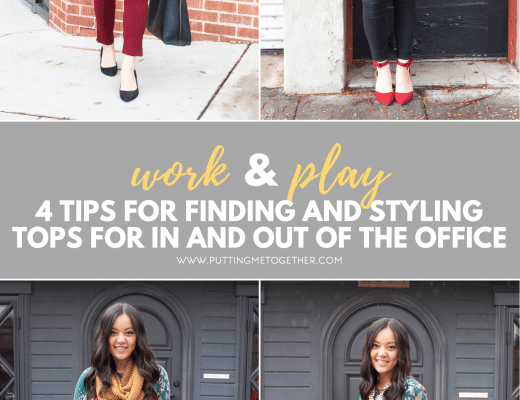 Spoiler alert: the search for a good pair of slacks wasn’t as hard as I thought it’d be!